Chun Sing Gai Bei (2010) - Sci-fi-central.com. Hong Kong  2010  110m   Directed by: Benny Chan.  Starring: Chrissie Chau, Mo-Chan Chik, Collin Chou, Chi-Kui Fong, Aaron Kwok, Elanne Kwong, Kibby Lau, Yau-Kuen Law, Simon Lee, Man-Wai Luk, Qi Shu, Nan Tie, Terence Tsui.  Music by: Anthony Chue. "City Under Siege" is an entertaining but sometimes strange mixture of a fantasy movie and an action-thriller with romantic elements as well as with slapstick influences and a more serious criticism of modern mass media. The movie portrays the story of the clumsy orphan Sunny who is working as a clown at his uncle's circus. His deceased father was a knife throwing master but Sunny is a charming loser who gets bullied by his more talented cousins who are also working at the circus. One day, his cousins want to explore a strange cave in the forest, used by the Japanese army when they occupied China. There are rumours of some precious gold hidden in the depths of the cave. Sunny overhears the plan and spies on his cousins but he gets discovered and caught. His cousins force the young adult to be the leader of the pack and look for the gold with them. The group finds several capsules indeed and force Sunny to open them. The first one is filled with gold and the leader of the cousins decides to separate the gold and to kill the unpleasant privy Sunny. He sends one of the cousins to strangle Sunny and push him into the abyss. Meanwhile the greedy leader opens another capsule but this one is filled with a strange gas that everyone present in the cave breathes in. Sunny manages to push his opponent into the abyss who dies there and to flee from his evil cousins. On their way out of the cave Sunny and his cousins get separated but they are mad at each other and bound to meet again. The strange gas soon transforms all of them. Sunny suddenly gets very fat as he runs across newscaster Angel who has a flat tire. They help each other and Sunny gets back to his uncle's warehouse. The next morning, he lost all of his fat and seems to be completely normal again. He soon realizes that he has changed though. All of his senses are sharpened and he soon uses them to save a kidnapped female police officer in front of newscaster Sunny who just got replaced by a younger and more beautiful woman at her agency. Both take advantage of the situation. Sunny becomes a beloved superstar and Angel his ambitious manager. Meanwhile, his evil cousins also transformed but in a different way. They also got sharpened senses but their skin bloated and they look like ugly mutants. Even kidnapped scientists can't heal them and believe that Sunny's metabolism must work differently from theirs. The evil cousins use their sharpened senses to commit crimes like robbing out banks and transporters. They are also jealous of Sunny's popularity and want to get his blood that might or might not be filled with antibodies that could heal the mutants. The police can't mess with them as injuries only seem to make These mutants stronger and more invulnerable. Even two mutant hunters who are supposed to get married soon can only kill one of them. They soon realize that they need the help of Sunny and Angel to set a trap and kill the pitiless mutants. The two men and women join their forces in a risky attempt to save Hongkong from its mutant siege. 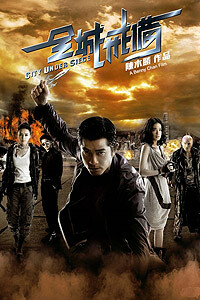 This fantasy-action movie has several convincing but also a few negative aspects. Let's start with the shallow aspects to end the review on a positive note. First of all, the mixture of genres in this movie is a little bit weird. The movie is sometimes too humorous to build up true tension. On the other side, some parts of it are too sad to make this a light-hearted film. I feel that the omission of the few slapstick elements would have improved the movie as the final result would have been much more mature. Due to the weird potpourri of genres, the movie undeniably has a few lengths. Some parts are dedicated to some character development but it feels a little bit forced as the different characters are sometimes wooden and stereotypical. They made me think of cheap rip-off versions of American superheroes and supervillains from Marvel for example. The actresses and actors were of a good average quality overall but as the script focused on fighting scenes and was inspired by several superhero movies they probably did the best they could out of it. Main actor Aaron Kwok incarnated a sympathetic loser who became a hero, the charming Qi Shu really carried the movie as ambitious newscaster with a tender side and Zhang Jingchu was also convincing as emotional and smart female demon hunter. I wish some of the other characters had been a Little bit more profound though. The special effects, fighting scenes and CGI effects are of a good but not excellent quality and can be cited as positive aspects of this film. Especially the villains look really ugly and could also be shown in an American movie. The fighting scenes finally had a more Asian feeling to it with a few influences from classic Easterns. Especially the fighting scenes in the uncle's warehourse, the television studio and in Angel's apartment were well done and can be cited as highlights of the movie. If you happen to be a fan of diversified superhero movies or more contemporary Hongkong action cinema, you should appreciate the movie for what it is. It's entertaining and some efforts were put into it but neither the effects nor the script offer anything revolutionary after all. All in all, it's a movie inspired by many Hollywood movies that should also please to a larger Western audience while fans of classic Asian action and fantasy cinema might surprisingly not like this film as much. Review by kluseba from the Internet Movie Database.